History Day is almost upon us! 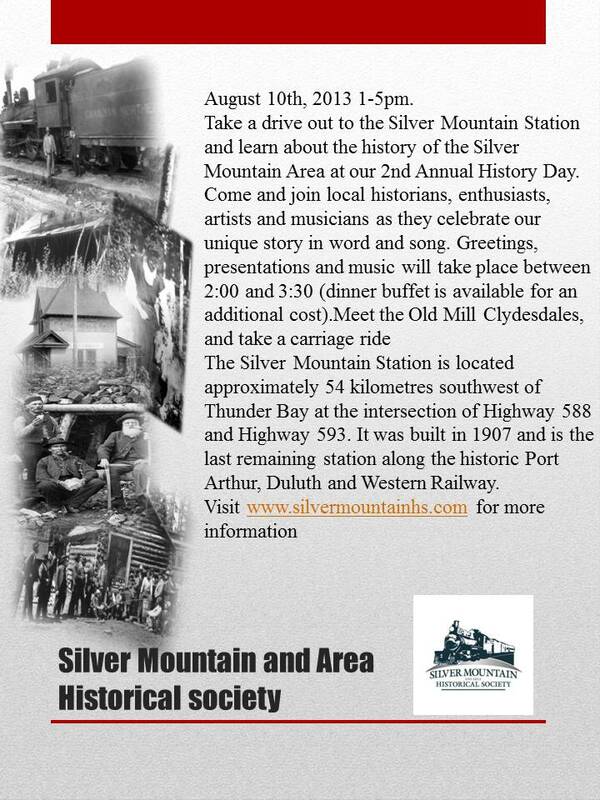 On Saturday, August 10th, 2013 the society will be hosting this great event at the historic Silver Mountain Station, located 45 minutes southwest of Thunder Bay at the intersection of Highways 588 and 593. The formal portion of the festivities will begin at 2:00 with greetings, presentations and music. A dinner buffet is available afterwards for $25 per person, $5 of which will be going directly to the society. Take a drive out to the Silver Mountain Station and learn about the history of the Silver Mountain Area at our 2nd Annual History Day. Come and join local historians, enthusiasts, artists and musicians as they celebrate our unique story in word and song. Greetings, presentations and music will take place between 2:00 and 3:30 (dinner buffet is available for an additional cost). The Silver Mountain Station is located approximately 54 kilometres southwest of Thunder Bay at the intersection of Highway 588 and Highway 593. It was built in 1907 and is the last remaining station along the historic Port Arthur, Duluth and Western Railway.